We’ve all seen the news stories and videos: Mass shootings, violent gang activity, and targeted assaults on first responders are on the rise. Fortunately, bullet and stab resistant vests have been effectively protecting most of our law enforcement officers for years. Today, we see EMS personnel wearing ballistic armor to every call. But wait a minute… we’re medical people, not one of those proverbial sheepdogs who protect the flock. Is this overkill for EMS? Are we addressing a blatant disregard for scene safety with a quick fix instead of education? Are “tactical paramedic” ambitions jousting towards Don Quixote’s windmills? Aren’t most violent or weapons-related responses contained and controlled by law enforcement long before paramedics step foot on scene? They are in Lubbock, Texas… we call it “staging” in the area. So why are we wearing ballistic vests for body armor? A little history: A few years ago, our hospital-based EMS recognized the increasing rate of violence within Lubbock and began considering options to protect our EMS personnel without impeding patient care. Our agency acknowledged that just like in the rest of the country, there were shootings, stabbings, and mass casualty threats within our city of nearly a quarter of a million people. That said, we also had a strong, dedicated police force to keep us safe and we worked well together. Now jump ahead to 2018 --- Our hospital purchased ballistic vests for every field EMT, paramedic, and supervisor within our service. It was not a strategically-planned and targeted weapons attack that brought about this change in protection. There was no conflict or concerns about police protection for our staff. Instead, it was the enormous rise in synthetic cannabinoid and bath salt abuse from 2013-2017 and the subsequent rise in calls for excited delirium, where we were confronted with patients who could not even be controlled with our standard sedation drug, Midazolam (Versed). Small foil packets of tainted grass and other dried vegetation - something innocently named “Scooby Snax”, “Breeze”, or “Mr. Happy Potpourri” - sold for just $5 at the local smoke shop were presenting risk of serious injury to not only patients, bystanders, law enforcement, but our EMS personnel as well. 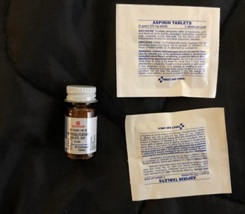 Intramuscular ketamine quickly became our medication of choice to protect and tame the patient, as law enforcement was not always deployed for our scene safety needs as these 9-1-1 calls may have come in as an unknown medical, vomiting, seizures, or check welfare. We saw a need for ballistic vests to protect ourselves from the weapon threats usually involved in these patient encounters. With multiple raids on smoke shops, improved legislation on synthetic cannabinoid sale and prosecution, and targeted efforts by Lubbock police working with state and federal agencies, the synthetic epidemic finally tapered down. But Lubbock’s population was increasing and as with any growing city in the US, the rate of violence was on the rise. Two of our EMS stations were shot at in a single night – fortunately, no one was injured. Improved dispatch algorithms for EMS and law enforcement evolved and police were responding to the suspected weapons calls and now more potentially-violent excited delirium patients. 2018 seemed safer, so again, do we really need all of that expensive body armor? The ball was already rolling through the finances department and UMC approved the purchase of the armor. Our EMS staff started wearing the lightweight ballistic vests for those just-in case encounters with a violent, armed patient or questionable scene. While the past history of violent events led to body armor use, we soon discovered a previously-unrecognized benefit in our daily meat-n-potatoes type responses. One of our frequent 9-1-1 requests is the “check welfare” call where a friend or family member has not heard from an elderly parent, college-age son, or friend with an extensive medical history in several days. Most of these concerned callers are living in another city or state and can’t just drive and check on the individual. Or, a home medical alarm company contacts EMS for an elderly person who has fallen and is unable to stand back up. These encounters are usually not a safety threat and we prefer to preserve our law enforcement resources for more pressing needs. There is something unique about Texas though, and particularly in the western part of the state: It seems that just about every man, woman, and child owns a gun. Yes, even in Texas, a child can legally own (but not purchase) a gun. Most individuals are responsible gun owners, and it’s not uncommon to walk into a home and see a locked steel gun safe weighing hundreds of pounds sitting in a corner of the bedroom. But, Texas paramedics and EMTs don’t suddenly run out of the house screaming, “scene safety!” --- in contrast, it usually spurs a conversation about the gun collection and an exchange on the latest wisdom about hunting rifles. Having trouble with small talk for assessing decisional capability? Start with a few words about the upcoming deer season or wild hogs tearing up the farm fields and you won’t have to say a word. Your patient will do all of the talking. So, going back to body armor: Are these hunters trying to kill our paramedics? Absolutely not. Instead, the ballistic vests find their value in the unexpected encounters. For example, we responded to a “check welfare” call where the out-of-state son was concerned about his father with recently-diagnosed mild dementia. His father is highly-functional and lives at home with occasional visits from friends and community health partners. The son frequently calls his father to check up on him, but this time he did not answer the phone so the son called 9-1-1. We arrived on scene and knocked on the door, which happened to be unlocked --- another west Texas behavior. While entering the residence, we announced ourselves as EMS and heard no response, so we cautiously continued into the home. As we entered the hallway, a frail elderly man was found frantically rolling his wheelchair down the hall. His eyes were fixated on the doorway behind us and he wouldn’t respond to our questions. He didn’t seem to understand our role or purpose and instead was intent on pushing past to the door behind us. As I glanced behind me, I saw exactly what he was driving towards: A double-barreled shotgun resting on the door post. He was exerting every effort towards getting his hands on that weapon because in his mind, two intruders were in his home and they were the threat. Dementia is a horrible disease. His case was supposed to be mild, but when coupled with an acute urinary tract infection that altered his mental status, he was doing exactly as we should expect him to do. He was protecting his life and his home, responding instinctively as any normal Texan would confronting a home invasion. I was able to secure the weapon before he reached the doorway and eventually calmed him, but what if his hands got to it first? What if shots were fired just as we entered the doorway earlier? Another response involved a call for diabetic complications out in a more rural area of the county. In this case, we arrived to find the front door wide open and obtunded patient sitting in the hallway. His blood glucose level was 30 mg/dL, and while occasionally agitated, he didn’t appear to be an immediate threat. Just your standard-issue hypoglycemia call near the “passed out” stage with a known diabetes history. 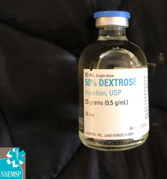 While administering the IV dextrose solution (D10W), I noticed that house was in disarray, in need of a lot of repair, and it looked like candy was scattered across the floor --- he must have been aware that his blood glucose was dropping but couldn’t fix it on his own soon enough. My partner was looking for a medical history or medications list in the house, and he stepped out of the nearby bedroom saying, “You need to see this”. We changed places and as I walked into the bedroom, I saw well over 80 bullet holes in the ceiling, walls, and furniture. Handguns and rifles were strewn across the bed and floor. I immediately requested law enforcement and as they arrived, the patient regained most of his mental status. He was calm, confused about our presence, but then remembered: He knew his blood glucose was dropping and dropping fast. Decades of his difficult-to-control diabetes also taught him that he’d soon lose his ability to make sound decisions and didn’t want to harm anyone. He emptied his weapons, but by that time, his brain chose the most unconventional method. Guns and other weapons are not the only threat. The human body is a formidable weapon in itself. The ballistic vests have protected our personnel from injuries that previously were once accepted as “part of the job”. Physicians, nurses, and emergency center staff know these risks and injuries well. Hypoglycemia, stroke/brain injury, medication effects, or drug/alcohol abuse can turn an otherwise pleasant individual into a kicking, screaming, biting, fighting weapon of pain. Trying to bathe a cat would be a breeze in comparison. The ballistic vests perform remarkably well in blunting the kicks, fists, and even bites towards our core. These are the potential injuries that can be most disabling for us on scene and risk our safety. I offer the experience and scenarios not to boast on “war stories” or to instill fear towards every patient encounter. But as we’re taught in our EMS classes and usually soon forgotten, every response has a potential for violence – intentional or not. Complacency can be fatal, but at times we also face situations where the risks will never be discovered until it’s too late. The individual decision to use body armor is a personal one. Some of our personnel see it as important as donning gloves with every call. Others bring their vests into the ambulance every shift as required by policy, but only wear them during known weapon-involved calls. While every paramedic or EMT is entitled to their own decision to use or not use their vest, it must be an informed one. Body armor’s role is more than protection from bullets and knives during a targeted attack. It’s the everyday calls: The daily hypoglycemia response, substance abuse, brain injury, or even delirium from untreated acute illness. As experienced providers and mentors, we should instill a culture of safety that embraces the wisdom offered by author and speaker Simon Sinek: “Leadership is absolutely about inspiring action, but it is also about guarding against mis-action.” The action is convincing decision makers that body armor investment for EMS personnel is necessary, while mis-action leads us to assume it’s only valuable for known weapon calls. Consider alternative scenarios to protect yourself and your partner from preventable, disabling injury that in just a moment of time, could destroy your career and livelihood if not life itself. I read with great interest the article regarding the wearing of ballistic and protective vests in EMS. This is something of a timely topic, as one of the committees I serve on in New York has this on our agenda as an item of discussion. We have wrangled with the notion of creating a best practices document to help EMS agencies in our state address the need for, and deployment of, ballistic vests. Some areas of the state have been able to move ahead in various ways to provide partial deployment, mostly of threat-level four plate-carrying vests for tactical environments, but few have delved, officially, into daily-wear vest systems. First, I’d like to be transparent about some of my own biases and experiences. Among the proudest and happiest days in my life were the first day I put a bullet-resistant vest on – my first day out of the police academy, and the last day I took it off – the day I retired from police work. For 23 years I wore the vest religiously, even though, at the time I started in 1990, it was not required for daily wear as a police officer. There were those in my department who resisted mandatory vest wear, despite the fact that they carried a firearm into every single encounter they ever had with a citizen – a weapon that could potentially be turned against them. Yet by the time I left, it was not even a second thought – the vest went on before the uniform. Having said that, I hated it, too. It was hot, bulky, stiff, and any time I got into any kind of tussle, I spent a good 20 minutes trying to get it seated right and getting my uniform tucked back in (I’m a bit challenged in that regard, I admit). When agencies such as the Chicago Police Department first started testing the outside vest carriers that looked like uniform shirts, I cheered, hoping it would someday make it to my department (it didn’t, at least not before I retired). I worked bicycle patrol for a number of years and I lost more weight from sweating than I did from the exercise. Now look at the EMS side of things. In the time that I worked in the City of Rochester, my ambulance had been shot at twice, I had been punched, kicked, bit, and threatened with stabbing, all the while (stupidly, I agree) walking right in with the local police on things that today, we’d stage down the block for until cleared into the scene. At the same time, I scoffed at those medics who wore bullet-resistant vests. Why? Because it was my observation that those who did, immediately seemed to get into more trouble than they had before. Likewise, it seemed the people who got into trouble were the first ones to put a vest on. By trouble, I mean those few (and we all know them) who managed to rile up every patient with a mental health issue, seemed to draw crowds around themselves at inopportune times, and got more than their fair-share of personnel complaints. These were often the folks whose chest seemed to puff out a little too much, and who seemed to feel they could take on the world single-handedly. I worried for them, and about their partners, all the time. Fast-forward to 2019. I cannot agree more with the author that things are violent and dangerous. I don’t know that I would agree they are any more so than 30 years ago, when crack cocaine was rearing its ugly head, and excited delirium was still called “cocaine psychosis.” But we are more aware, and we are busier, and so are our law enforcement partners. So the danger may be more visible, in-your-face, not to mention we may be much more aware of it through social media and information sharing. So where is my concern? First of all, what is the purpose of wearing ballistic or edged-weapon protection? I’m loath to bring up what events transpired in my region some not-so-distant years ago (particularly since it involved a friend and colleague), but in that instance, ballistic vests would not have been of benefit. Yet immediately after that incident, fire departments around the region and the country started talking about buying ballistic vests. My question then as now is, why? When will you wear them? Will you put them on under your turnout gear? 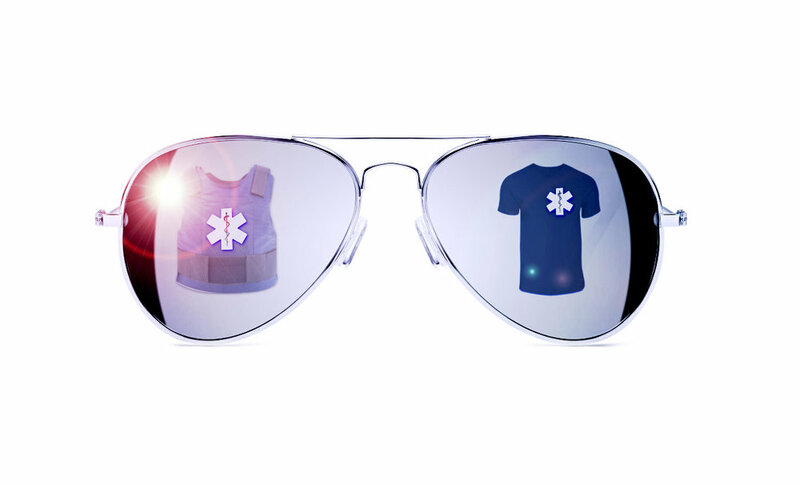 Will you wear them on every call all the time? If you’re a career firefighter or EMS provider will you wear it all the time, over or under your uniform? What does that mean for you, and for your practice? Because I see a good number of people (and police officers now, which irritates me to no end) wearing outside-carry vests festooned with pockets and carry points. So the uniform is no longer the first thing a patient sees. It’s the ballistic vest. We might no longer present the image of primary caregivers, but perhaps be easily mistaken for police. They are bulky, catch on things, and yes, you can take them off, but they still get hot when they’re on, which for practical purposes, should be most of the time. Let’s talk about under-uniform vests then. For threat-level II or III (and their progeny, IIA and IIIA) vests, under the uniform wear makes sense. It is less intrusive, less visible, and depending on what style is purchased, can be integrated with stab-resistance and water repellency. They are also hot, stiff, and make movement about inside an ambulance, or incident scene, challenging. Uniforms will be untucked and it will be annoying, but you can work through that. The thing to watch out for is the feeling of increased protection morphing into a sense of improved invulnerability. And thence, potentially, increased risk-taking. What else? Cost. Who bears the brunt of that? The author was fortunate to have a hospital system than was progressive and financially positioned to purchase these, but what about municipal, commercial, not-for-profit, and volunteer agencies? Medicare reimbursements being what they are, we are all holding on by a thread just to upgrade aging cardiac monitors and keep ambulances running. While taking care of our people should be foremost in company leadership’s mind, does that extend to providing this level of protection? In the law enforcement world, the National Institutes for Justice realized early on that the benefit of protective bullet-resistant vests warranted federal subsidy. For every year that I was on the job, my vest was partially, and in some cases wholly, funded through federal grants. Are those same grants or funding streams available for fire and EMS personnel? The author points out that it is important for people to make informed decisions about wearing vests. So let’s talk about some limitations and considerations. If you have to buy a vest, I return to the question of what threat level? What are you protecting against? Small arms, rifles, close range, far away? Of much more concern to me is, frankly, edged weapons. However most bullet-resistant vests do not protect adequately from stabbing, thus Corrections’ use of SpectraTM and similar materials in stab-resistant vests. There are those manufacturers who incorporate both (I had one for Bike Patrol) but they are increasingly expensive. So cost and type of protection are key factors in this decision. And I submit few EMS providers, let alone agency leaders, are knowledgeable enough to make these choices, so if you are considering it, best do your research or find yourself a subject matter expert to help. What about moisture? KevlarTM and TwaronTM fabrics, which make up the bulk of bullet-resistant vest manufacture, are susceptible to becoming soaked through, at which point they lose some or most of their ballistic integrity. This was one reason I chose to use a combined Spectra/Twaron vest for bike patrol. EMS providers are often in the rain, and sweating in cramped, semi-conditioned environments, so how effective will your protection be when the time comes? As a police officer, I had the luxury of being able to go back to my station and swap carriers, keeping my car air conditioned, and making darn sure I wore a raincoat when I was outside for a period of time (most of the time, anyway). That has not always been the case as an EMS provider. What about training for the intended user? How much training do EMS providers have in the limitations, care, and replacement of bullet-resistant vests? I was acutely aware of the fact that I had a huge open area under my armpits that was not protected. It was never so apparent as when I wore a short-sleeve shirt in changing weather, and could feel the cold air rush up my arm while in a standard bladed stance addressing a potential adversary. Do EMS providers know how to stand to maximize their ballistic protection? Do they know how far down the vest goes, or doesn’t go, to protect their abdomen, and their sides? Up to this point I’ve somewhat danced around the issues of why we should wear the vest, and written about the challenges and considerations. I don’t think anyone can argue, with any kind of standing, that there is not a place for bullet-resistant and edge-weapon protective vests in the EMS environment. I do believe that there are a good number of considerations that must be addressed before anyone lays a hand on one, or picks up the thread to start obtaining them. The author makes excellent and valid points about the ancillary protective benefits of the vests, from blunt attacks to motor vehicle crashes. I know of a friend who avoided a serious spinal injury during a crash because his ballistic vest acted much like a KED. But when we talk about “lightweight ballistic vests,” let’s make sure we’re talking apples and apples, and not Kevlar and Spectra. Finally, I agree with the author that there is a particular lack of situational awareness (Oh, how I hate that term!) in EMS today. It is getting better, and there are a number of good programs across the country trying to improve not only provider safety awareness, but EMS defensive tactics (shout out to Kip Teitsort and the folks at DT4EMS). I posit that we should be spending our hard-won funds in this area before we invest in protective vests. Then, and only then, can we fully understand the threat, and address the use of protective equipment effectively. As both a Paramedic and an Emergency Medicine Physician Assistant I commend those who made the announcement of the Emergency Triage, Treat and Transport (ET3) payment model a possibility. This is by far, one of the biggest steps in the advancement of modern EMS. This historic payment model could finally bring an end to the “you call, we haul” motto that has plagued EMS since its inception. One of the most beneficial sections of this new payment model is that it allows current EMS providers the option to transport to hospitals, urgent cares, primary care offices, or, when necessary, to “stay and play”, allowing EMS professionals to provide treatment in place with qualified healthcare providers, via telehealth when necessary. While I feel this is beneficial to the EMS community as a whole, it begs the question what does this mean for the day to day provider? As a paramedic, I am thrilled that this may curve the overwhelming amount of calls that do not require trips to the emergency room. 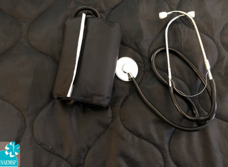 I can recall many trips for simple requests, such as prescription refills, cast removal, cold and cough symptoms, or suture removal that would be placed in triage and often still be sitting in the same seat when I returned with the next patient. I often thought to myself that there has to be another way - that trips to the ED were not always the answer, but if only we could take them to their primary care office, or utilize technology to communicate with their provider. Then there were the many calls I would run that would end without any transport at all. Often there would be treatment provided on scene, but then would come the refusal of transport. For paramedics, these are also some of the highest risk refusals, but that’s another topic on good documentation. I feel that the lack of access to healthcare was the basis of many non-transport calls, people whose only reliable way to see a provider was to call 911. A perfect example is the underinsured patient with diabetes. Patients who needed their blood sugar checked, were hypoglycemic, received treatment and when alert again, would sign the refusal of transportation form. These trips would often end with a call to a medical control provider but would yield no payment to the EMS service. For years, we have fought to be recognized as a valued part of the medical team, and this new service model has the possibility of being a giant leap for EMS kind. Not only does this require the implementation of quality metrics for EMS service but provides paramedics a platform to shine. 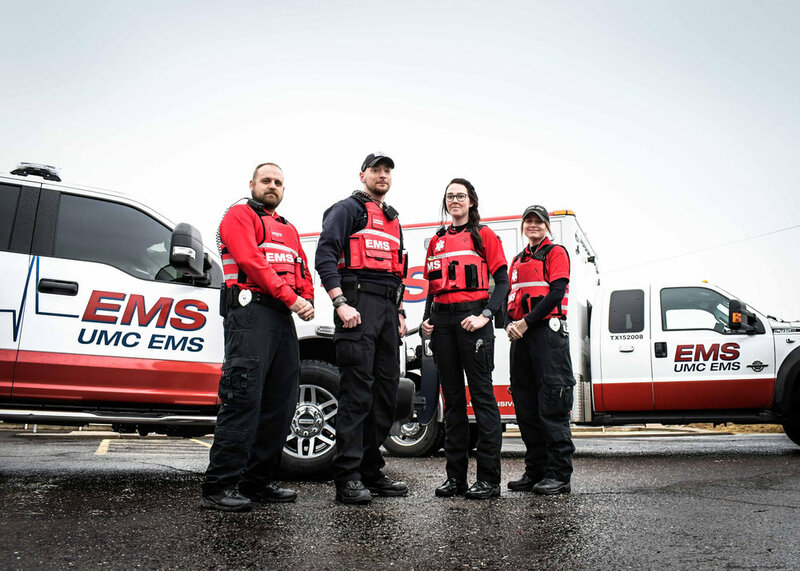 EMS providers are now able to highlight their mastery of pre-hospital medicine, human pathology, knowledge of medical protocols, and dedication to patient care, no matter where that care may be delivered. This is our chance to prove to the world that paramedics and EMTs are capable of quality, evidence based prehospital medical care, and not just basic transport. With increased power comes greater responsibility and thus the responsibility of advanced education now falls onto the shoulders of my EMS family. Advanced education, in the form of college degrees or specialty certification, is paramount for providers making definitive decisions for patients, and as professional healthcare providers, we should not fear this change. At this time, paramedics are faced with the ability to be valued members of the medical community, it is time we seize this moment to bear the responsibility, to ourselves, our patients and our communities. As a PA, the ability of alternative (more appropriate) destinations brings the obvious benefit of a decompressed ED waiting room. Many of my patients are there because they have no other avenues to see a provider. This new payment model is a way to allow for a more efficient and effective pre hospital triage, and subsequently improved treatment of the 911 patient. Paramedics in the field would now be able to utilize urgent cares and primary care providers to facilitate the most appropriate level of care, while having the ability to be paid for the services they provide. It also allows for a closer collaboration opportunity between in-hospital providers and pre-hospital providers via additional resource utilization, such as telehealth. Overall I think this is a great leap in the right direction for EMS and the future of our profession. This new reimbursement model creates standardized benchmarks for the EMS providers. The goal of which is to improve the quality of care, while decrease the overall cost of healthcare. It is our responsibility as EMS providers to show that we are worthy of this opportunity and seize it with overwhelming care, compassion, and efficient care for our patients. It is also our responsibility to make assure we have the education, knowledge and the skills to advance the EMS profession and allow ET3 to be the giant leap forward EMS so desperately needs. This may also allow for new relationships between EMS providers and hospitals in the region to be formed. It is my hope and belief that this announcement will improve the effectiveness and efficiency of prehospital medical care and allow the continued growth of MIH programs nationwide. Can ET3 push the field of medical direction to where it should be? The Center for Medicare and Medicaid Services’ (CMS) passage of the Emergency Triage, Treat, and Transport model (ET3) not only recognizes EMS as part of the health care system but is a significant step in developing a mature EMS system. But what does this mean for the EMS medical director? It is unlikely that we will be notoriously ignored like the 1973 EMS System Act of old. But will it help propel the office of the EMS medical director from an often unpaid (or underpaid) position struggling to fulfill the needs of the EMS system to a widely recognized and valued component of the healthcare system? Before we attempt to answer these questions, let’s review what the ET3 model hopes to establish. A new model for prehospital care that allows for increased flexibility and efficiency. 3) or provide treatment in place with a qualified health care practitioner, either on scene or connected using telehealth. ET3 hopes this model will encourage cooperative agreements between local EMS systems and surrounding dispatch systems, hospitals, clinics, local governments, etc. This system also allows for increased accountability of systems through monitoring of programs through specific QI/QA metrics. What does this mean for the Medical Director? Not just a “sign here Doc” system. If we ask any lay person what a good fire or police chief can do for their community, they may not answer with specifics, but they implicitly understand the role of such leadership positions. If you ask them what a good EMS medical director can do for their community, you’re probably going to get a blank stare. Perhaps we have been too complacent in advertising what it is that a good EMS medical director can do for the EMS service and community. Let’s take the opportunity now to highlight what a good medical director can do to ensure the success of ET3 and improve community health. At the heart of it all, a medical director is a physician first. Physicians have duty to ensure that the patient remains at the center of the system -an active medical director ensures that the patient is always number one. With the ET3 expansion of EMS systems there needs to be increased involvement and oversight by medical directors. As experts in the medical direction and having an intimate knowledge of how hospital systems operate as physicians, medical directors are a required leader for connecting the hospital, EMS systems, local governments, and other entities in a collaborative partnership. Many systems will be creating new processes, such as 911 triage, processes for determining optimum patient destination and who can best be treated in the home. New protocols requiring in-depth physician input will need to be developed, trialed, updated, and re-trialed. Constant quality improvement and quality assessment will need to be completed. Continuous quality improvement, quality assessment, and timely feedback by the EMS Medical Director are required to ensure the safe medical care of the patient. Results will need to be published, presented, and discussed allowing for programs to learn from each other. Medical directors will need to be present, both in discussions at a higher level, but also on a ground level where practical application occurs to ensure a smooth maturation of the EMS system for the safety of our patients and still receive valuable data. ET3 allows for treatment to occur in the home in coordination with a qualified healthcare practitioner. Behind every prehospital provider that completes an in-home evaluation, there is the medical director who has provided focused, up to date education, training, and consistent quality assessment. In order to provide treatment in place, there will need to be a conversation with a qualified healthcare practitioner. For many systems, this will be a conversation with their medical director. This medical director will need to be accessible for consultation. As a subspecialty of medicine, EMS should optimize the opportunity provided by ET3 to move EMS medical direction from “what is” to “what should be”. We would be remiss not to recognize that unfortunately the term “medical director” currently describes a wide range of physician roles – from rubber stamp signatures on paperwork unknown personally to frontline providers to those who are involved in all aspects of patient care provided by an agency. The reason for this spectrum in medical direction is multifactorial. EMS as a medical subspecialty is rather young, although EMS subspecialty fellowship training is working to build a larger base of involved EMS physicians. At the state, agency or regional level, EMS medical directors are often excluded from decision-making. In addition, many medical director positions remain un- or under-funded and full time or majority time EMS physicians are few among us. Reimbursement rates for medical direction (the cost) largely do not acknowledge the value that an involved medical director can bring to the healthcare system. This will be even more evident as we consider treat in place and alternative destinations which will better align patient needs with the current financial incentives of the healthcare market. The pilot will end. What needs to happen to make the future successful? Will a change in reimbursement structure such ET3 be the nidus to move medical direction to where it should be? We think it can. Fundamentally, systems that have relied on rubber stamp physicians will not be able to function in this expanded model. EMS physicians will need to step up to both this challenge and responsibility. Hopefully this new model provides a financial means to support them in doing so. The ET3 is a 5-year pilot project. Which means it will end. In order to make this a sustainable option in the future, medical directors will not only need to be careful trackers of data, allowing for cost analysis of the impact, but leaders who demonstrate wisdom, integrity, and the expertise required to navigate the unique world of healthcare both in and out of hospitals while keeping an ever-vigilant eye on maintaining patient-focused care. Let’s become the EMS Medical Directors we all strive to be. You are called for a 25-year-old male, possible overdose, unknown if breathing. On arrival, the patient is unresponsive on his bathroom floor. Family reports they found him on the floor not breathing just prior to calling 911. They had last seen him well 15 minutes prior. He has a known history of heroin use, and you notice an empty syringe next to him. On exam, he is unresponsive, cyanotic, with agonal respirations and has a pulse of 40. The phenomenon of opioid-related noncardiogenic pulmonary edema (NCPE) is not widely known in the prehospital realm. As we are in the midst of an opioid crisis, the odds that the average field provider will encounter opioid-related NCPE is increasing. The ability to recognize this phenomenon and knowing what to do will make all the difference to your patient. The physician William Osler first described narcotic-related pulmonary edema during an autopsy in 1880 [1,2]. Its presentation and clinical course was not appreciated until the 1950s-60s. The prevalence of opioid-related NCPE is about 2-10% of heroin overdoses [1,2]. It is most commonly seen in heroin overdose but has been reported with other opioids. Other theories blame naloxone. 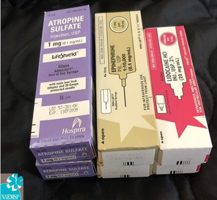 A patient who is opioid dependent, overdoses, and who is rapidly reversed with a high dose of naloxone subsequently experiences a catecholamine surge, particularly in those with concomitant cocaine use. 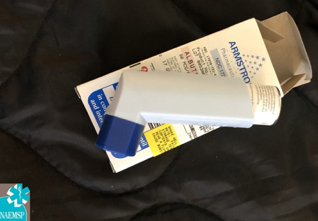 A second theory blaming naloxone is that following a prolonged period of near or complete apnea, reversal that results in inspiratory effort prior to complete opening of the glottis can result in excessive negative pressure within the lung, drawing in fluid from the pulmonary vasculature. Administering positive pressure ventilation prior to naloxone therapy may mitigate this. It is likely that opioid-related NCPE is multifactorial, with both the opioid agent and naloxone contributing. Regardless of the underlying etiology, treatment remains the same. The medic recognizes that this patient is experiencing opioid-related NCPE. Only 8 minutes from the nearest emergency department, RSI is deferred in favor of immediate transport. CPAP is placed onto the patient at a pressure of 5 cm H20. The patient tolerates CPAP well, and oxygenation is improved to 90% on arrival at the emergency department, where care is transferred. The patient continues to improve on CPAP and is admitted for further monitoring. All patients with opioid-related NCPE warrant transport. A 48 y/o unconscious male presented with dizziness and weakness in his office. On arrival of paramedics, patient is diaphoretic and unresponsive, but with pulse and spontaneous respirations. Initial assessment reveals a glucose level of 23 mg/dL. Paramedics find the patients current medication list in the patient’s wallet. Patient is given IV dextrose and regains consciousness. After returning to baseline the patient is refusing transport and further treatment. How do you proceed? Diabetes is one of the most common chronic disease, with estimated diagnosis of 23.1 million people in the United States and another 84.1 million adults with prediabetes. As diabetes continues to increase in our population, hypoglycemic events are rising secondary to the use of insulin and oral hypoglycemic agents. Insulin management has been related to the most serious cases of hypoglycemia, either due to strict goals of keeping normal glucose levels or due to confusion between dosing and type of insulin medication. Other diabetes medications like sulfonylureas have been linked to episodes of hypoglycemia and accidental ingestion in the pediatric population. Although hypoglycemia is more common in type 1 diabetes (T1DM), patients with type 2 diabetes (T2DM) experience a similar frequency of these events as they require more aggressive treatment. The National Electronic Injury Surveillance System-Cooperative Adverse Drug Event Surveillance (NEISS-CADES) has estimated that around 97,648 ED visits occur annually due to insulin-related hypoglycemia and errors related to diabetes management. It has been accounted that around 10% of ED visits are considered under Adverse Drug Events (ADEs) occur annually. Around 95% of hypoglycemic events occur outside of medical settings, requiring assistance by family members, other caregivers, or emergency medical services (EMS) personnel. Patients with diabetes might not understand when hospital evaluation is needed for proper management of low blood sugars. EMS personnel carry most of the weight of identifying red flags of hypoglycemic episodes that require further workup as some cases can be fatal. There is a continuous debate in the ambulance service as to whether patients suffering from hypoglycemia need to be transported to the hospital after examination and treatment in the field. While some studies have referred that most cases of hypoglycemia can be successfully treated at the scene, conflictive results have been reported in other cases with complications days later. 5. Absence of complicating factors that require ED evaluation, such as renal dialysis, chest pain, alcohol, dyspnea, of falls. Clinical manifestations of hypoglycemia are nonspecific, and can be divided into neurogenic and neuroglycopenic symptoms. As reported by NEISS-CADES, patients over 80 years old have a higher risk of being hospitalized due to hypoglycemic events since neuroglycopenic symptoms can mimic other cardiovascular and neurologic conditions. Other studies regarding younger groups, involving T2DM and over the age of 50 and glycated hemoglobin (HbA1c), suggest that both extreme hyperglycemia and hypoglycemia contribute to poor outcomes when encountering a hypoglycemic event. This can also be applicable for patients with Diabetes Type 1 with extreme values of HbA1c, as recurrent episodes of hypoglycemia and impaired awareness during these episodes are known major risk factors for these events. The National Model EMS Clinical Guidelines (NASEMSO Model) published on 2017, facilitated hypoglycemia protocol. Treatment is focused on level of consciousness and patient disposition will also rely on initial neurological presentation. In a nutshell, a conscious patient with a patent airway can obtain oral glucose, with adults receiving approximately 25 grams of dextrose (at a concentration of 10-50%) and pediatric patients receiving 0.5-1g/kg (at a concentration of 10-25%). Regardless of National EMS guidelines established for hypoglycemia, there is still variability in EMS protocols throughout the United States. [10-12] Further studies are required to determine the reasons underlying these variations and patient outcome. Patient was given an early lunch at the office, had normal vital signs, and normal EKG. On further questioning patient refers he did not eat breakfast because he was running late for work but did administer his insulin. Patient denied any other symptoms and a coworker is able to stay and watch after the patient. Paramedics used their well person protocol to determine if any abnormalities warranted further intervention. Assessed patient for capacity and oriented the patient about the need for close follow up. Patient indicated he understood all orientations and refused further care. Any patient with seizures, persistent symptoms of hypoglycemia, and that does not comply with the NASEMSO Model for release without transport criteria should be taken to the emergency department for further evaluation. Hepburn, D. A. et al. "Symptoms Of Acute Insulin-Induced Hypoglycemia In Humans With And Without IDDM: Factor-Analysis Approach." Diabetes Care 14.11 (1991): 949-957. Web. 9 May 2018. McLaughlin, S. A., Crandall, C. S., & McKinney, P. E. (2000). Octreotide: an antidote for sulfonylurea-induced hypoglycemia. Annals of emergency medicine, 36(2), 133-138. "National Model EMS Clinical Guidelines". Nasemso.Org, 2017, http://www.nasemso.org/documents/National-Model-EMS-Clinical-Guidelines-2017-Distribution-Version-05Oct2017.pdf. Accessed 20 May 2018. 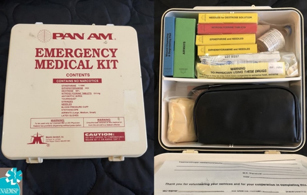 Khunti, K., Fisher, H., Paul, S., Iqbal, M., Davies, M. J., Siriwardena, A. N. Severe hypoglycemia requiring emergency medical assistance by ambulance services in the East Midlands: A retrospective study. Primary Care Diabetes.2013; (7):159-165. EMS Week: Save a life day! But alas, not all days are as action filled. Some days, its the little things that make the biggest difference...like tourniquets! Well, our very good friend, Dr. Scott Goldberg (@EMS_Boston) is quite passionate about this device and wanted to speak to highlight one of the Prehospital Emergency Care Journal's manuscripts concerning tourniquets. Our tourniquet expert, Dr. Scotty G of that small institution in Boston called Harvard :P.
Dr. Goldberg sat down with the lead author, Dr. Scerbo, to discuss her manuscript: Safety and Appropriateness of Tourniquets in 105 Civilians. It's a true reminder that this simple maneuver with this little doohickeys can be a safe way to save a life. So check out this discussion here for EMS Week day 4: Save a Life day. Happy #EMSWeek to all our EMS providers, be safe, stay #EMSstrong, and continue doing what you do best: Saving lives. Thank you for all you do.